Wisconsin Oven Corporation manufactured a natural gas-fired enhanced duty walk-in oven for a transportation technology company. This is a repeat customer for Wisconsin Oven and the industrial oven will be used for heat treating baskets of aluminum parts. At Wisconsin Oven, a large portion of our business is from repeat customers. We focus on providing excellent customer service each step of the way, from the time we take the first call to after the equipment is installed and operational. The heat-treating oven has a maximum temperature rating of 315°C (600°F) and work chamber dimensions of 6'0" wide x 15'0" long x 6'0" high. The equipment has sufficient capacity to heat 5,952 kg (1,312 pounds) of aluminum from 21°C (70°F) to 250°C (482°F) within 120 minutes when loaded into an ambient oven. The industrial oven is designed with a vertical lift, pneumatically operated door, and a 12-gauge aluminized floor. A powered load car rated at 13,125 pounds will be used to load and unload the oven. The body is constructed with industrial board type insulation with a 1,200°F service temperature rating. Guaranteed temperature uniformity of ±3°C (5.4°F) at 250°C (482°F) was documented with a standard nine (9) point profile test conducted in an empty oven chamber under static operating conditions. 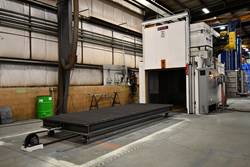 This heavy duty walk-in oven was fully factory tested and adjusted prior to shipment from our facility. All safety interlocks are checked for proper operation and the equipment is operated at the normal and maximum operating temperatures. An extensive quality assurance check list was completed to ensure the equipment met all Wisconsin Oven quality standards. This equipment is backed by Wisconsin Oven’s Exclusive and Unprecedented 5-Year WOW™ warranty (parts only). Wisconsin Oven Corporation has been designing, engineering, and manufacturing industrial ovens and other heating equipment since 1973. Their custom and standard industrial ovens are used for a multitude of applications including heat treating, finishing, drying, and curing. Many of the industries they serve require specific temperature uniformity and equipment performance documentation. Their experienced design team is able to meet even the most stringent standards for their customers’ equipment. Wisconsin Oven realizes that the success of the company depends on their Championship team of employees, which is why they have developed a company culture that recognizes and rewards employees. The goal at Wisconsin Oven is to outperform the competition and provide customers with outstanding products and service.